What does T.E.A.C.H. Pay For? Early Childhood Teacher Licensure and/or Endorsements through coursework in Early Childhood Education or Early Childhood Special Education at Lyndon State College’s Higher Education Collaborative, and the Peer Review process for Early Childhood Teacher Licensure. Work in a regulated preschool, child care center, or home program for at least 30 hours per week. Have worked with children birth to age 5 in current program for at least 3 months. Are working toward a Child Care Apprenticeship Certificate, Early Childhood Associates Degree, or an endorsement or teacher licensure at a Vermont college. Have the support of your employer (if applicable). Demonstrate participation in or progress towards a quality initiative such as STARS, Head Start, or NAEYC/NAFCC accreditation. Child care programs who co-sponsor a T.E.A.C.H. scholarship recipient. T.E.A.C.H. 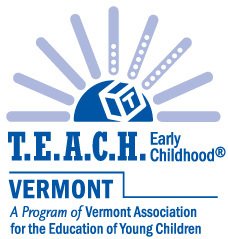 Early Childhood® VERMONT is a licensed program of Child Care Services Association of North Carolina.